Faulty Diction, is a series of large color photographs ranging in size from 4ft to 6ft and depict sport trophy figures kicking, hitting and holding books. 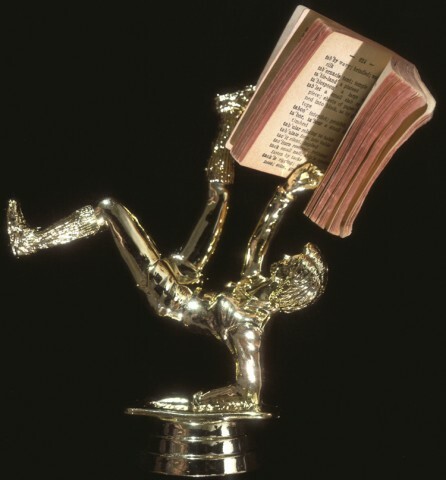 Miniature books placed in the hands of trophy figures questions our knowledge of scale and exaggerate the significance of the sentiment of the souvenir. I am interested in the capacity of objects to serve as traces of authentic experience. All of the photographs show the books at size and have not been altered.